Kill fleas, ticks, lice, and mites on pets and bedding! 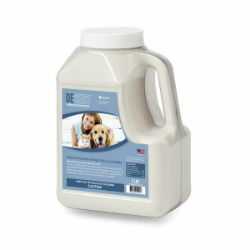 Specially blended food grade diatomaceous earth (DE) for effective insect control. DEsect™ PET physically abrades and absorbs the exterior protective waxy cuticle layer of the insect, resulting in rapid death by dehydration. Kills Insects Dead on Contact. Insects cannot become immune. Easy and ready to use, with shaker style lid for easy application.